Joe Tonelli receives his NIAAA Hall of Fame honor from NIAAA President and Glastonbury AD Trish Witkin and NIAAA Executive Director Bruce Whitehead. INDIANAPOLIS, Ind. (release provided by the NFHS) – CIAC executive staff member and longtime athletic administrator Joe Tonelli is one of 12 high school athletic directors who was inducted into the seventh Hall of Fame class of the National Interscholastic Athletic Administrators Association (NIAAA) December 15 in Orlando, Florida, during banquet festivities at the 46th annual National Athletic Directors Conference co-sponsored by the NIAAA and the National Federation of State High School Associations (NFHS). Tonelli joins these 11 other outstanding administrators in the 2015 NIAAA Hall of Fame class: Ron Balazs, CAA, Florida; Frank Kovaleski, CAA, Indiana; David Morgan, CMAA, Virginia; David Nelson, CMAA, Virginia; Joni Pabst, CAA, Arizona; Ronald Park, Nebraska; Sam Rasmussen, CAA, Indiana; Carol Satterwhite, CAA, Maryland; James Simmons, CAA, Louisiana; Robert Whitehouse, Nebraska, and one individual who will be inducted posthumously –Maurice “Bud” Campbell of Utah. This year, Joe Tonelli is celebrating his 50th year in high school athletics as a teacher, coach, athletic administrator and national administrator with the Connecticut Interscholastic Athletic Conference (CIAC). Tonelli, who earned his bachelor’s degree from the University of South Carolina and his master’s from Southern Connecticut State University, began his secondary education career as a teacher and coach for one year at South Catholic High School in Hartford, Connecticut. He then moved to his alma mater, Notre Dame High School in West Haven, Connecticut, in 1967 and remained there until 2006. His time at Notre Dame included 11 years as a teacher and head basketball coach and 30 years as director of athletics. During his 30 years as athletic director, Notre Dame teams won 21 state championships and more than 50 league titles. Tonelli was instrumental in “Challenge 2000” – a capital campaign for athletics and physical education that raised about $2 million to renovate the indoor athletic facilities and outdoor practice fields and practice track. NIAAA Hall of Famer Joe Tonelli with CAAD Executive Director Fred Balsamo. 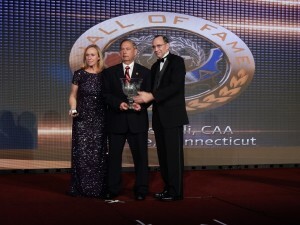 Tonelli was a founding father of the Connecticut Association of Athletic Directors (CAAD) and was president and served on the CAAD Board of Control. He also was the CAAD consultant to the CIAC Board of Control. In addition to his work with the CAAD, Tonelli provided tremendous service to the NIAAA during his time as an athletic director. He was a member of the NIAAA Delegate Assembly, was the first Connecticut liaison to the NIAAA, organized the first NIAAA Section 1 meeting in Boston and served on the NIAAA Membership Committee. In addition, he was a workshop presenter at several National Athletic Directors Conferences. Tonelli also assisted the CIAC in various capacities while at Notre Dame, including serving on the CIAC Officials Committee, consultant to the CIAC Baseball Committee and the CIAC Eligibility Review Board and umpire assignor for the CIAC Baseball Tournament. He also was a member of the Connecticut High School Coaches Association Executive Board and served on the NFHS/NIAAA National Athletic Directors Conference Advisory Committee and was the Section 1 representative on the NFHS Officials Association Advisory Committee. Tonelli has crafted another entire career since retiring from Notre Dame High School, serving as director of the CIAC Officials Association since 2005 and as a CIAC executive staff member since 2006. With the CIAC, Tonelli handles the sports of cross country, field hockey, indoor track, ice hockey, lacrosse and outdoor track. He also assists with the CIAC Baseball Tournament and works with the CAAD to conduct the New Athletic Administrators Workshop. As head of the CIAC Officials Association, Tonelli works with the leaders of the 54 officiating Boards, provides opportunities for officials to have representation on all CIAC sports committees, and assists with recruitment of new officials. 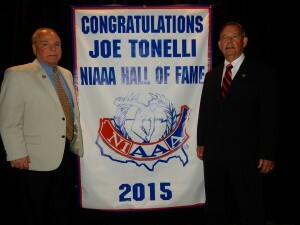 Tonelli has been inducted into several previous halls of fame, including the Connecticut High School Coaches Association Hall of Fame, the University of New Haven Hall of Fame and the Notre Dame High School Hall of Fame. He received the CAAD Distinguished Service Award, the NIAAA State Award of Merit, the NIAAA Distinguished Service Award and the NIAAA Thomas E. Frederick Award of Excellence. Ron Balazs retired in 2004 after an outstanding 35-year career as a teacher, coach and athletic director in the Dade County Public Schools in Miami, Florida. His career included 14 years as a wrestling and football coach and 21 years as an athletic director. Since his retirement as an active athletic director, Balazs has served as executive director of the Florida Interscholastic Athletic Administrators Association (FIAAA). After graduating from Ohio State University and teaching biology at the high school level for three years, Balazs moved to Florida and joined the staff at Coral Park Senior High School in Miami as a teacher and wrestling coach. He coached wrestling for seven years and then was head football coach for seven years before becoming the school’s athletic director in 1983. Balazs was athletic director at Coral Park High School for 17 years before concluding his career as athletic director at Miami Felix Varela Senior High School from 2000 to 2004. During his administrative career in the Dade County Public Schools, Balazs was a member of the Greater Miami Athletic Conference Executive Committee and served on committees that addressed recruiting, eligibility, improving test scores, guidelines for fund-raising, budget cuts and implementing a course for coaching certification. Throughout his career, Balazs was heavily involved with the FIAAA, the Florida High School Athletic Association (FHSAA) and the NIAAA. Before beginning his service as FIAAA executive director in 2005, Balazs was the organization’s district director, president-elect, president, past president and conference chair. He served as the FIAAA’s liaison to the FHSAA as well as Florida’s liaison to the NIAAA, and he was a member of the FIAAA Board of Directors. In addition, Balazs has been a member of the Florida Host Committee for several National Athletic Directors Conferences that have been held in the state of Florida, including the 2004 National Conference when he was co-chair of the Host Committee. Within the FHSAA, Balazs has been a member of the FHSAA Board of Directors, chair of the organization’s Athletic Director’s Advisory Committee and Wrestling Sports Committee, and a member of the FHSAA Tournament Committee. At the national level, Balazs has been an NIAAA member since 1983 and a voting delegate since 1988. He served a term on the NIAAA Board of Directors (2000-04) and was a member of the Credentials Committee – including a term as chair – and the Professional Development Committee. Among his awards at the state level, Balazs was selected FHSAA Coach of the Year and FIAAA Athletic Administrator of the Year. Nationally, he previously was honored with the NFHS Citation, and the NIAAA Special Commendation and the NIAAA State Award of Merit. The late Maurice “Bud” Campbell retired in 1998 after an outstanding 38-year career in the Murray (Utah) Public Schools, including 28 years as athletic director at Murray High School. Prior to entering athletic administration, Campbell coached football, basketball and baseball and was selected Baseball Coach of the Year in 1967, 1968 and 1971. In addition to the baseball coach-of-the-year honors, Campbell coached the Utah South All-Star Team and had a tremendous impact on many student-athletes during his days as a football, basketball and baseball coach. Campbell placed great emphasis on citizenship and sportsmanship throughout his coaching and administrative career. Campbell was active in providing athletic opportunities to the community and organized numerous camps and clinics to reach kids. He was the director and host of the Utah Junior Jazz Clinic for six years, and many of the camps and clinics helped support the Murray athletic budget. Campbell also was involved in numerous civic activities, including the Boy Scouts of America (B.S.A. ), where he has served as a scoutmaster for 34 years. He has served on the B.S.A. Council Executive Board and Council Leadership Board. He received the Silver Beaver Award and the district Award of Merit. At the state level, Campbell was a huge contributor to the Utah Interscholastic Athletic Administrators Association (UIAAA), and his service to the state athletic administrators association did not end with his retirement in 1998, continuing until his death earlier this year. A member of the UIAAA Athletic Directors Executive Board for 29 years, Campbell organized the UIAAA Retired Athletic Directors Association in 1999. As a retired athletic director, Campbell served on the UIAAA Board of Directors from 2007 to 2010, including a term as president in 2007-08 and past president in 2008-09. Campbell’s term as president was one of the most successful in the organization’s history. He helped to initiate the first strategic plan and a new athletic directors’ training program that now trains an average of 30 to 40 athletic directors annually. During Campbell’s term as president, membership in the association and attendance at the annual conference reached all-time high marks, and the spring conference was expanded to a four-day event. Campbell also devoted many hours of service to the Utah High School Activities Association (UHSAA) as director of numerous state tournaments, including hosting the UHSAA State 4A Girls Basketball Championship 12 times and the UHSAA State 3A Wrestling Championships three times. Nationally, Campbell was a member of the NIAAA Membership and Services Committee for three years, the NIAAA Hall of Fame Committee for seven years and the NIAAA Delegate Assembly for seven years. He completed 16 Leadership Training Courses and attended 13 National Athletic Directors Conferences. Campbell received numerous awards from the UIAAA, including Athletic Director of the Year in 1997, and induction into the UIAAA Hall of Fame in 2001. He received the NIAAA State Award of Merit in 1998 and the NIAAA Distinguished Service Award in 2009. Frank Kovaleski retired in 2005 after 16 years with the NFHS and NIAAA. A longtime Indiana high school athletic director and coach before joining the NFHS staff, Kovaleski expanded professional development opportunities for high school athletic directors during his tenure as national director of the NIAAA. Most significant among those opportunities was the creation of the NIAAA Leadership Training Program (now Leadership Training Institute) in 1996 and expansion of the NIAAA Certification Program in 1999. The Leadership Training Institute has expanded to a current offering of 40 courses, and more than 35,000 courses have been completed by athletic directors at state, regional and national conferences since the program’s inception 19 years ago. In 1999, two additional levels – the Registered Athletic Administrator (RAA) and Certified Master Athletic Administrator (CMAA) – were added to the certification program. In 2003, through Kovaleski’s efforts, the NIAAA formed an arrangement with Ohio University to offer a master’s degree in athletic administration through online courses. He also was responsible for starting the NIAAA Endowment in 1994. Kovaleski also played a significant role in the success of the National Athletic Directors Conference, which is held each December and annually attracts 1,500 to 2,000 high school athletic directors. Prior to devoting full-time duties to the NIAAA and the national conference in 2002, Kovaleski made significant contributions to the NFHS as the organization’s meeting planner and as rules editor in track and field. He was instrumental in enacting rules changes that improved safety in pole vault and discus events in high school track and field. Kovaleski brought a rich background in athletic administration to the NFHS in 1989, having served as a high school athletic director since 1965 in three different Indiana high schools. He began his career at Union City (Indiana) High School, followed by a five-year stint at Triton High School in Bourbon, Indiana. Kovaleski was athletic director at New Castle (Indiana) High School for 15 years and at Richmond (Indiana) High School for four years. During his years at the high school level, Kovaleski also coached track, football and tennis. A graduate of Bicknell (Indiana) High School, Kovaleski earned his bachelor’s degree in 1963 from Indiana State University and his master’s in 1969 from St. Francis College in Fort Wayne, Indiana. Among his honors, Kovaleski was Indiana high school athletic director of the year in 1981, and he received the NFHS Citation in 1987, the NIAAA Distinguished Service Award in 2008 and the NIAAA Award of Merit in 2009. When he retired in 2005, the NIAAA created the Frank Kovaleski Professional Development Award, which is presented annually to an athletic director. In 2007, he was inducted into the National Council of Secondary Schools Athletic Directors Hall of Fame. In addition, Kovaleski was selected as team manager for the U.S. pre-Olympic basketball team that played in the Soviet Union in 1978. Since his retirement, Kovaleski has been active in church work. He currently is a member of the Executive Committee of the Southern Baptist Convention. David Morgan has distinguished himself as a leader in athletic administration at the local, state and national levels, including 41 years in the Fairfax County Public Schools (FCPS) and Arlington County Public Schools (ACPS) in northern Virginia. A graduate of the University of Virginia in 1974, Morgan was a teacher and coach at several high schools in Arlington and Reston for 10 years before becoming director of student activities at J.E.B. Stuart High School in Falls Church in 1984. After five years at Stuart, Morgan accepted a similar position at South Lakes High School in Reston, where he served for 12 years. He concluded his career as director of student activities at Oakton High School in Vienna, Virginia, from 2001 to 2004. Before moving into athletic administration on a full-time basis, Morgan coached football, wrestling, track, golf, baseball and softball for 10 years – seven years as a head coach. After a brief retirement, Morgan returned to the FCPS in 2008, where he has served the past seven years as assistant principal/director of student activities at various high schools for short-term vacancies. During his 20 years as an active athletic director, Morgan’s teams won 52 district titles, 10 regional titles and six state championships. More than 20 individuals claimed state championships during his tenure, and two students earned national titles. In addition, he assisted the Virginia High School League (VHSL) by hosting state tournaments in football, field hockey and girls gymnastics. He also hosted more than 30 regional tournaments and 60 district tournaments for the VHSL and served on numerous committees. Within the Virginia Interscholastic Athletic Administrators Association (VIAAA), Morgan has served on the VIAAA Board of Directors since 1985 and was an officer from 1991 to 1997, which included a term as president from 1993 to 1995. He has chaired the Professional Development, Corporate Sponsors and Past President’s Council committees, and was a member of several other VIAAA committees. Nationally, Morgan has been a tireless contributor to the NIAAA. He served on the NIAAA Board of Directors from 1995 to 2000, including a term as president in 1999. He also was chair of the NIAAA Professional Development Committee and Past President’s Council, and he served as NIAAA parliamentarian from 1990 to 1994. He was an original member of the NIAAA Hall of Fame Committee and served six years until 2013. Morgan was involved with starting the NIAAA Endowment Committee in 1999 and has been involved with the NIAAA Leadership Training Institute as an instructor since 1997. He was the first chair of Leadership Training Course 514 and served on the Leadership Training National Faculty for 10 years. Morgan also was chair of the Programs Committee for the second NIAAA Strategic Plan. In addition, Morgan was a coaching education instructor from 1990 to 2004 and has been a speaker and moderator at numerous National Athletic Directors Conferences. He also authored several articles for the IAA Magazine and was co-author of the “Profile of the Athletic Administrator in the 90s” published by the NIAAA. Among his many awards, Morgan was selected Virginia AAA Athletic Director of the Year in 1992 and has been inducted into the Arlington County Sports Hall of Fame, the South Lakes High School Sports Hall of Fame and the Virginia High School League Hall of Fame. Nationally, he received the NIAAA Distinguished Service Award in 2001 and the NFHS Citation in 2003. David Nelson retired in 2006 after a tremendous 40-year career as a teacher, coach and athletic director at two Virginia high schools and a wealth of service to state and national athletic administrator organizations. After graduating from Salem (West Virginia) College in 1966, Nelson was a teacher and coach at Kecoughtan High School in Hampton, Virginia, for 10 years. He was head tennis and junior varsity basketball coach and was an assistant coach in several other sports, while teaching government and history classes. Nelson then served the final 30 years of his career (1976-2006) at Poquoson (Virginia) High School. He was head boys basketball coach for 15 years and head girls basketball coach for nine years and compiled a combined 358-261 record. He also taught government, sociology and world history classes at Poquoson and was chairman of the social studies department for two years. During the final 21 years at Poquoson High School, Nelson was the school’s athletic director, leading the school’s teams to 60 district titles, 34 regional titles and three state championships. Nelson was responsible for the addition of numerous sports during his tenure, as well as the construction of softball and field hockey fields. In addition, Nelson established a coaching education program at Poquoson High School and developed the first handbook for coaches, parents and students. He also hired the school’s first certified athletic trainer and certified strength instructor in 1999. At the state level, Nelson has been a member of the Virginia Interscholastic Athletic Administrators Association (VIAAA) Executive Board since 1987. He was president of the VIAAA from 1991 to 1993 and has been a presenter at the VIAAA state conference every year since 1991. On behalf of the Virginia High School League (VHSL), Nelson was a leader in establishing coaching education and training new athletic directors across the state. He has served two terms on the VHSL Executive Committee and has also served on the VHSL Policy Committee, Steering Committee, Appeals Committee, Sports Advisory Committee and the Coaches Education Committee. Nelson also directed VHSL state championships in girls and boys tennis, softball, volleyball, wrestling and football and hosted numerous VHSL regional and district championships. Nelson also has devoted countless hours to the Virginia Coaches Association, serving on its executive board from 1983 to 1992. Despite his full schedule within the state, Nelson has been an active NIAAA member for many years. He served on the organization’s Communications, Issues and Resolutions Committee, including a term as vice chair. He later was chair of the NIAAA Resolutions Committee. Nelson also was involved with the Strategic Planning Committee and has been a presenter at the National Athletic Directors Conference. Among his awards, Nelson was VIAAA Athletic Director of the Year in 1992 and was selected to receive the VIAAA John C. Youngblood Lifetime Achievement Award in 2005. He received the NIAAA State Award of Merit in 1995, the NIAAA Distinguished Service Award in 2002 and the NFHS Citation in 2005. In 2009, Nelson was inducted into the VHSL Hall of Fame. During her 24-year career (1986-2010) in the Tucson (Arizona) Unified School District, Joni Pabst established herself as a leader in the athletic administration profession – at the local and state levels as well as nationally with the NIAAA. Since 2012, Pabst has served as executive director of the Arizona Interscholastic Athletic Administrators Association (AIAAA). After beginning her work in education in Little Rock, Arkansas, for four years, Pabst launched her career in the Tucson Unified School District as a physical education teacher at Catalina High School and the girls volleyball coach at Sabino High School. From 1987 to 1998, Pabst was a teacher, volleyball coach, chair of the physical education department and assistant athletic director at Cholla High School. Pabst moved into athletic administration in 1998 when she accepted the position of assistant principal/athletics and activities at Santa Rita High School. She served at Santa Rita for seven years before moving to Sahuaro High School, where she served in a similar position until 2010. In addition to being responsible for all athletics and activities groups at Santa Rita and Sahuaro, Pabst served as the site director for numerous playoff contests for the Arizona Interscholastic Association (AIA). In 1997, Pabst was the tournament director for the AIA 4A girls golf tournament and the 4A track and field championship. She directed the AIA state cross country meet in 1998 and 2001, and served on the AIA Executive Board from 2004 to 2007, culminating with a term as president. Pabst, who earned her bachelor’s degree from the University of Central Arkansas and her master’s from the University of Arizona, began her service to the AIAAA in 1995 and has been one of the key leaders in the promotion of the athletic administrators profession in the state since that time. She was an AIAAA officer from 1995 to 2011, including a term as president in 2001-02. She also served as treasurer and coordinator of the state conference. In 1996-97, Pabst was co-director of track and field competition for the Senior Olympics at the Senior Sports Classic in Tucson. She planned and conducted all aspects of the seven-day national event. At the national level, Pabst has been an active member of the NIAAA since 1993. After serving on the Awards Committee for five years, Pabst was elected to the NIAAA Board of Directors in 2006 and was NIAAA president in 2008. In 2001, she was a member of the NIAAA Blue Ribbon Panel at the National Athletic Directors Conference and has been the Arizona delegate at the NIAAA Delegate Assembly on several occasions. Pabst’s numerous recognitions include the University of Arizona Outstanding High School Faculty Award in 1995, the NIAAA State Award of Merit for Arizona in 1999, the NFHS Girls Cross Country Official of the Year for Arizona in 2001, the Arizona 4A Athletic Director of the Year, the NIAAA Distinguished Service Award in 2003 and the NFHS Citation in 2005. In 2010, Pabst was inducted into the AIAAA Hall of Fame. Ron Park concluded his 37-year career in education as director of athletics and activities at Omaha (Nebraska) Millard North High School from 1981 to 1995, where he was responsible for 21 varsity sports and numerous junior varsity, sophomore and freshman programs. In addition to the usual administrative duties of developing the budget, ordering equipment and overseeing construction and upkeep of the school’s athletic facilities, Park was a regular host of tournaments for the Nebraska School Activities Association (NSAA). He also developed the Athletic Director’s Handbook and Coaches’ Handbook at Millard North. Due, in part, to his leadership, Millard North was the winner of the Omaha World-Herald combined all-sports award for Class A. During his 14 years as an athletic director, Park was heavily involved in the Nebraska State Interscholastic Athletic Administrators Association (NSIAAA) and the NIAAA. He was secretary-treasurer of the NSIAAA from 1984 to 1986 and was selected as the District 5 representative on the NIAAA Board of Directors from 1985 to 1987. As a member of the NIAAA Board of Directors, Park was the first Section 5 representative to initiate a summer meeting of all Section 5 states, which was held at Millard North High School in Omaha. Park also was a speaker at back-to-back National Athletic Directors Conferences in the mid-1980s. Park began his career in education in 1958 in Page, Nebraska, where he was a social studies teacher and basketball coach until 1962. His basketball teams were district champions three times in his four-year stint at Page. In 1963, Park began his long and successful tenure at Millard High School as a social studies teacher, basketball coach and guidance counselor. He was promoted to director of guidance and counseling in 1970, and by the time he left the position in 1980, Park was responsible for one high school, two junior high schools, 10 elementary schools and 16 counselors. During his time as director of the guidance department, Park developed a student self-scheduling program at Millard High School, which was a new concept at the time in the Omaha schools. Park has been honored with many awards during his successful career in education, including Nebraska Athletic Director of the Year in 1987, the NIAAA State Award of Merit, NIAAA Special Commendation for service on the Board of Directors and induction into the Nebraska High School Sports Hall of Fame in 2007 – one of the first athletic directors to be enshrined. In 1989, Park received the NFHS Citation at the National Athletic Directors Conference in Dallas. In addition, Park was selected as a panelist for the White House Conference for a Drug-Free America in 1987 and was inducted as part of the first class of the Millard Hall of Fame in 2013. Sam Rasmussen retired in 2011 after 40 years in education as a teacher, coach and athletic director – all but one of those years at Valparaiso (Indiana) High School. Rasmussen started his career in 1971 as a teacher and coach at Chesterton (Indiana) High School. After one year of retirement, Rasmussen was selected executive director of the Indiana Interscholastic Athletic Administrators Association (IIAAA) in 2013 and remains in that role today. Before beginning his 26-year journey as director of athletics at Valparaiso High School in 1985, Rasmussen was a teacher and cross country and track and field coach. He also served as director of swimming for most of his 39 years at Valparaiso. Rasmussen’s 1985 and 1986 boys cross country teams won Indiana High School Athletic Association (IHSAA) state titles and he was named Indiana Boys Cross Country Coach of the Year both years. He also was chosen Indiana Track and Field Coach of the Year two times. During his time as director of athletics, Rasmussen was chair of the Duneland Athletic Conference (DAC) five times, established and implemented the All-Academic DAC program and developed the DAC’s procedures and guidelines for sport bylaw change proposals. Rasmussen also initiated the DAC’s Sportsmanship Summit. In addition to having been the DAC chair for swimming, diving and basketball, Rasmussen also instituted girls soccer, softball, freshman boys baseball and athletic training at Valparaiso. He established the school’s athletic hall of fame and was a member of the school corporation substance abuse team as well. Rasmussen was also the program director at Onseyawa Handicapped Children Camp and the developer of Camp Pocohachi Handicapped Children Camp. At the state level, Rasmussen was the tournament director for more than 500 IHSAA sectional, regional and semi-state tournaments in 20 sports. He also was a member of the IHSAA Football Realignment Committee and helped institute a new athletic directors workshop in conjunction with the IHSAA. Rasmussen has devoted many hours of service to the IIAAA, including serving as the president in 2004-05. He also held the positions of first vice president, second vice president and professional development chairperson. Rasmussen was also the IIAAA Gymnastics Sport Proposal Chairperson and the founder of the IIAAA Scholarship Program. Rasmussen was a tremendous contributor to the NIAAA throughout his career at Valparaiso. He was a member of the Board of Directors for five years, including a year as president in 2009, and he has been a state coordinator for the Leadership Training Institute (LTI) since its inception in Indiana. He also assisted in four NIAAA leadership training summit institutes, and has been a CAA test administrator since 1998. Rasmussen’s service to the NIAAA did not cease with his retirement. Currently, he is chair of the fourth NIAAA Strategic Plan Finance Subcommittee, and is a member of the NIAAA Accreditation Committee and NIAAA Past Presidents Council. In addition to his coaching awards, Rasmussen has been honored on many occasions for his contributions to athletic administration, including the NIAAA State Award of Merit in 1991, Indiana State Administrator of the Year in 2001, IIAAA Charles F. Maas Distinguished Service Award in 2006, NFHS Citation in 2007 and NIAAA Distinguished Service Award in 2011. Rasmussen graduated from Mynderse Academy High School in Seneca Falls, New York, and earned an associate of arts and science degree in 1969 from Concordia College in Bronxville, New York. He later earned bachelor’s and master’s degrees from Valparaiso University. Carol Satterwhite, who devoted her career to teaching, coaching and athletic administration at Columbia (Maryland) Wilde Lake High School, continued that active involvement well into her retirement. Satterwhite was a physical education teacher at Wilde Lake during her entire tenure at the school from 1971 to 2002. She was the physical education chairperson from 1972 to 1977, as well as the school’s athletic director from 1972 to 2001. After retiring from Wilde Lake in 2002, she served in various acting athletic administration positions for five years at two high schools and as the athletic coordinator for the Howard County Public Schools in Maryland. In 2004, she was selected executive director of the Maryland State Athletic Directors Association (MSADA) and remains in that position today. Satterwhite’s career included a wide range of coaching stints at Wilde Lake. She was the girls varsity basketball coach (led them to a state semifinals appearance in 1976), the varsity softball and field hockey coach, the junior varsity field hockey coach, the girls outdoor track and field coach, and the golf coach. In addition to her coaching and administrative accomplishments at Wilde Lake, Satterwhite was a valuable contributor to the Howard County Public School System (HCPSS) and the MSADA. She was an organizing member of the Howard County Athletic Directors Association, served on numerous committees and continues to assist today with the HCPSS Athletic Handbook Revision Committee. In addition to her current duties as MSADA executive director, Satterwhite has been the association’s treasurer since 1995 and a member of the Awards Committee since 2013. She also handles MSADA conference registration and membership. Satterwhite also assisted the Maryland Public Secondary Schools Athletic Association (MPSSAA) on several occasions. She served two terms on the MPSSAA Board of Control, was chair of district basketball and softball playoffs for two years, and hosted numerous district and regional athletic competitions at her school. In addition, she has been a Maryland state delegate to the NIAAA’s Section 2 since 2002, a Maryland state liaison to the NIAAA since 2000, and a presider for the “How to Successfully Resolve Parent Conflicts” workshop at the 1998 national conference in Las Vegas. Satterwhite was chair of the Maryland Host Committee for the 2014 National Athletic Directors Conference in National Harbor, Maryland. Satterwhite received the NIAAA Distinguished Service Award in 2001 and the NFHS Citation in 2008, and she was inducted into the MSADA Hall of Fame in 2002. She also was selected Howard County Coaches Association Girls Basketball Coach of the Year and the MSADA District V Athletic Director of the Year. When it comes to high school sports in Lafayette, Louisiana, James Simmons has been the clear-cut leader for more than 40 years. After 20 years as a teacher and coach at Acadiana High School and 23 years as athletic director of the Lafayette Parish Schools, Simmons retired in 2013, though he remains active in several volunteer capacities. Simmons was a teacher and head cross country/track and field coach and assistant football coach at Crowley High School for 13 years and Acadiana High School in Lafayette for six years until 1990, when he accepted the position of Director of Athletics, Student Activities, Health and Physical Education and Compliance for the Lafayette Parish Schools. Among his accomplishments in that position, Simmons was successful in gaining an agreement with the consolidated government for the use of golf courses, swimming pools, tennis courts, gymnasiums and outside fields by the school system. In addition, Simmons negotiated an agreement with a local sports medicine company to have certified athletic trainers at each high school until the last practice, as well as medical doctors at every football game – all at no expense to the school system. Outside his duties in the Lafayette schools, Simmons had a tremendous impact within the Louisiana High School Athletic Association (LHSAA) and the Louisiana High School Athletic Directors Association (LHSADA). Simmons served on the LHSAA Executive Committee from 1997 to 1999 and was a member of numerous other LHSAA committees including the Hardship Committee, Wildcard Selection Committee and School Relations Committee. Since 1994, Simmons has been the referee at the LHSAA State Track and Field Championships. Within the LHSADA, Simmons was president on two occasions (1995-96 and 2005-06) and is the LHSADA liaison to the NIAAA. Nationally with the NIAAA, Simmons was a member of the NIAAA Board of Directors (1994-97), the second Strategic Plan Committee, the NIAAA Hall of Fame Ad Hoc Committee and the NIAAA Blue Ribbon Panel at the 1998 National Athletic Directors Conference in Las Vegas. In addition, he has completed 10 Leadership Training Institute classes and is an instructor for Leadership Training Classes 504, 506 and 508. Simmons also has been a contributor to the NFHS with service on the National High School Hall of Fame Screening Committee (1999-2003) and the NFHS Coaches’ Quarterly Publications Committee. During his time on the publications committee, Simmons had two articles published in the NFHS Coaches’ Quarterly magazine. In addition to his 21 years as referee of the LHSAA State Track and Field Championships, Simmons was the starter for the USA Track and Field Seniors Championships in 1993, head clerk of course for the NCAA Men’s and Women’s Track and Field Championships in 2005 and an official at the 1992 U.S. Track and Field Olympic Trials. Among his many awards, Simmons was named LHSADA Athletic Director of the Year in 1993, and he received the LHSAA Distinguished Service Award in 2005, the Louisiana High School Coaches Association Distinguished Service Award in 1999 and was inducted into the Louisiana High School Sports Hall of Fame in 2012. Simmons’ national awards include the NIAAA State Award of Merit in 1999, the NFHS Citation in 1999 and the NIAAA Distinguished Service Award in 2003. While his time as a high school athletic administrator was limited to 12 years, Bob Whitehouse had a tremendous impact on the profession at the state level in Nebraska and nationally with the NIAAA. Whitehouse was one of the early leaders in high school athletic administration in Nebraska while serving as assistant principal/director of athletics at Omaha South High School from 1971 to 1983. During that time, Whitehouse was president of the Nebraska State Coaches Association and the Nebraska Athletic Directors Association (now the Nebraska Interscholastic Athletic Administrators Association). Thanks to his leadership at the state level, Whitehouse was selected by Tom Frederick, NFHS associate director in charge of athletic directors programs, to be one of the eight members of the original NIAAA Constitution Committee. Whitehouse attended the historic meeting in February 1977 in Elgin, Illinois, and became one of the founding fathers of the NIAAA. Whitehouse attended the National Athletic Directors Conferences annually from 1973 to 1982 and in 1990 received the NIAAA Special Commendation for Distinguished Service to Interscholastic Athletics. He also was honored at the state level in 1982 when he was selected Nebraska Athletic Director of the Year. During his time in athletic administration and continuing today, Whitehouse assisted the Nebraska School Activities Association as assistant director of the Nebraska State Track and Field Championships. In 1983, Whitehouse moved into school administration as principal of Bryan Junior High School in Omaha for four years and then concluded his active career in education as principal of Bryan Senior High School in Omaha from 1987 to 2000. For the past 15 years, Whitehouse has continued to serve in education in short-term or interim capacities, including adjunct professor at the University of Nebraska, Omaha; educational consultant for the Omaha Public Schools; interim principal for the Omaha Public Schools Career Center; coordinator of the Nebraska Educational Leadership Institute; co-coordinator of Middle School Learning Center Initiative for the Omaha Public Schools; and co-coordinator of Collective for Youth for the Omaha Public Schools. Whitehouse has been involved with the National Association of Secondary School Principals (NASSP) and was president of the Omaha School Administrators Association. He currently serves on the Nebraska High School Sports Hall of Fame Board of Directors and is a former chair of the board of the University of Nebraska Board of Regents. In addition to aforementioned awards, Whitehouse was inducted into the Omaha Public Schools Athletic Hall of Fame in 2012 and the Omaha Bryan High School Track Invitational was named in his honor in 2014. He was named Omaha Public Schools Outstanding Principal of the Year in 1997 and received Distinguished Service Awards from the Nebraska Association of Secondary School Principals in 1997 and the Nebraska Council of School Administrators in 2001.